The Total Hollywood Experience™ is Hollywood’s only truly in-depth experience including our world famous Hollywood Behind-the-Scenes tour and LA City Tours’ Movie Stars Homes Tour. 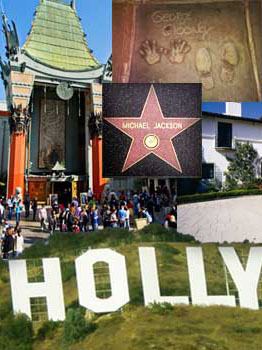 LA City Tours’ Movie Star Homes Tour is the most highly rated tour of its kind in Hollywood. While many tour operators may offer a stars homes tour, the difference is in the experience. We offer a higher level of customer service and attention to detail. Celebrating our 15th anniversary, Hollywood Behind-the-Scenes is a world renowned experience that connects visitors with the Hollywood they imagine. Visit movie locations that stared A-List Celebrities (Julia Roberts, Keanu Reeves, Sandra Bullock, Mark Wahlberg, Charlize Theron, Cameron Diaz, Drew Barrymore and more), visit legendary movie palaces, find your favorite Celebrity’s star as we walk the Walk of Fame, view the Hollywood Sign, and visit celebrities’ favorite hidden hideaways. Go inside places normally closed to the public. Place your feet onto your favorite celebrity’s footprints at the Chinese theater. Walk the footsteps of the Movie Stars when you visit Awards Walk, home to the Academy Awards. This tour changes your Hollywood visit from ordinary to extra-ordinary! Our most popular tour! All of your favorite celebrity star homes! Showcasing the Hollywood Sign via Mulholland Drive • Beverly Hills • Rodeo Drive • Bel-Air • the Sunset Strip. From the stars of yesterday to the mega-stars of today, everyone is sure to see their favorites. Travel with entertaining expert guides with exciting narration and stories, through legendary neighborhoods and locations. View the homes of current celebrities and stars of the past. Don’t visit LA without seeing the Celebrity & Star Homes Tour! Get your camera ready, you just might see a STAR! Tour hours do not include hotel pick-up and drop off time. Tour routes are subject to change due to city ordinances. World Famous Hollywood Sign – The Hollywood Sign is a landmark and American cultural icon. 90 years of glamorous history! Beverly Hills, Rodeo Drive, Bel Air & the Sunset Strip – Drive through Beverly Hills, where the movie stars and other celebrities shop. Drive through Sunset Strip – where Stars party and shop! See the Viper Room, the Roxy, the Rainbow, Comedy Store, and lots of night clubs. Find a fun place to go out at night! If you come back tonight, you might see some of your celebrities partying also! You can either walk-in* to meet the tour at the LA City Tours office located on the Hollywood Walk of Fame or you can option a free hotel pick-up. Hotel pick-ups are for REGISTERED HOTEL GUESTS ONLY at hotels in Hollywood, Beverly Hills, Downtown LA, Mid-Wilshire, West Hollywood, and North Hollywood areas only. Pick-up times above are approximate for the area. A more specific time will be given to you for your hotel after you purchase the tour.